Hufflepuff has long been the most mockable Harry Potter house, largely because the idea that founder Helga Hufflepuff “took the rest”—a.k.a. the students without discernible personality types—doesn’t exactly inspire confidence. But now it seems that Gryffindor is the house lowering its standards. 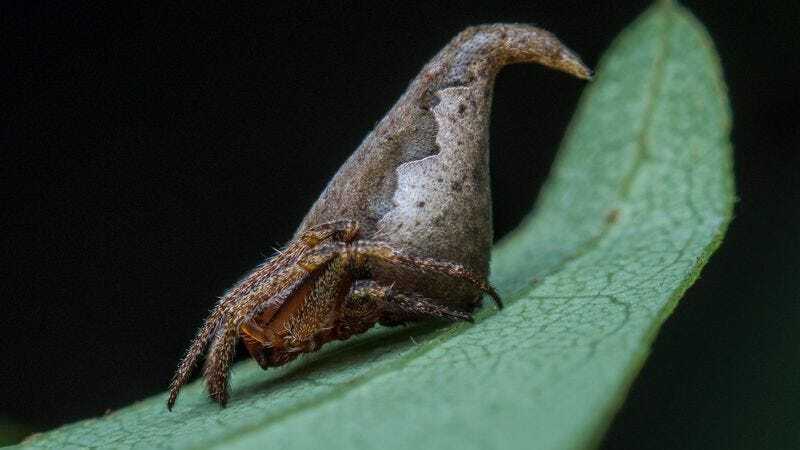 In fact, it’s stooped so low as to add spiders to the mix: A newly identified species of spider has been dubbed “Eriovixia Gryffindori.” And scientists chose the name because the arachnid looks just like the Hogwarts sorting hat, which once belonged to house founder Godric Gryffindor. This uniquely shaped spider derives its name from the fabulous, sentient magical artifact, the sorting hat, owned by the (fictitious) medieval wizard Godric Gryffindor, one of the four founders of Hogwarts School of Witchcraft and Wizardry, and stemming from the powerful imagination of Ms. J. K. Rowling, wordsmith extraordinaire, as presented in her beloved series of books, featuring everyone’s favorite boy-wizard, Harry Potter. An ode from the authors, for magic lost, and found, in an effort to draw attention to the fascinating, but oft overlooked world of invertebrates, and their secret lives. This actually isn’t the first time an insect has been named after something from the Harry Potter world. Back in 2014, a previously unnamed species of wasp was dubbed “Ampluex dementor” by a fan contest at the Museum of Natural History in Berlin.